"It would seem that for most of us life comes in phases. ... These are common to all, but there are also phases peculiar to each of us. I am now looking back over the period when I was actively engaged in the work of the Hospital and the teaching carried on there. Thinking of my early days and the difficulties then confronting me I wondered if in any way I could help those starting out on the same road. As a result, I am tempted to offer you this paper on some of the emergencies confronting the beginner in homeopathic general practice. 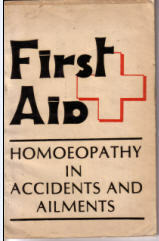 I think emergencies are one of one's greatest difficulties when beginning to practise Homoeopathy. In an acute emer­gency one has to do something immediately; we cannot spend time hunting for a drug. All these emergency cases fall roughly into two main groups - the patient who is dying, and the patient who is in great pain. You sometimes get the two combined. There is a third problem - Is the case medical or surgical ? - and that is always at the back of one's mind. Here it is your general medical skill that comes in; in the other two types it is a question of homoeopathic knowledge. So it is the dangerous case and the case of acute pain that I want to consider here. 3. The case of acute cardiac attack of the anginous type. For the acute cardiac failures ,I think you will find that most of your cases require one of four drugs,: Arsenic, Anti­mony tart, Carbo veg., and Oxalic acid. There are various points about these individual drugs which help you in your selection, and you will find that very soon you begin to select your drug almost as quickly as you spot your pathological condition, and by the time you have overhauled your patient you know what to give. In the Arsenic case, you have the typical Arsenic mental distress, with extreme fear, extreme anxiety, mental and physical restlessness, and with a constant thirst, a desire for small sips of ice-cold water. So far as the actual local symptoms are concerned the main complaint is of a feeling of extreme cardiac pressure, a sensation of great weight on, or constriction of, the chest, as if the patient cannot get enough breath in, and a fear that he is just going to die. The patients as a rule are cold, they feel cold, but they may complain of some burning pain in the chest. In appearance they always look extremely anxious and are grey, their lips rather pale, may be a little cyanotic, and they give you the impression of being very dangerously ill. They often have a peculiar pinched, wrinkled, grey appearance. As a rule in these cases you will get the history that the attack has developed quite suddenly, and the response to Arsenic should be equally quick. 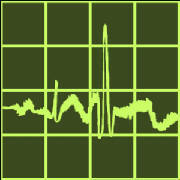 If you do not get a response to Arsenic within a quarter of an hour the patient is not an Arsenic one. The first response that you ought to get is a diminution of the patient's mental anxiety and extreme fear; the restlessness beginning to subside, and he begins to feel a little warmer. In these cases my experience has been that you are wise to administer the highest potency of Arsenic you have with you, and as I now carry all remedies up to the cm. I always give cms. of Arsenic. But whatever potency you have with you, use the highest, because this is the kind of case that will die very rapidly and you gain more by giving whatever potency you have than by wasting time going home to get a higher one. The Arsenic seems to act very much like a temporary cardiac stimulant, and I find that in the majority of these cases you have to repeat the dose, certainly to begin with, about every 15 minutes. The next thing is that very often one sees a case of that sort which responds perfectly well, the patient is better, every­one feels he is getting over it, and then in three, or four, or six hours the symptoms begin to come back, the patient no longer responds to Arsenic, collapses and dies. That was my experience at one time. Then it began to dawn on me that I had given another drug during the reactive period I could have carried these cases on. I found that when this was done the patients did not get the secondary collapse and were thus saved. To achieve this result, you have to give your secondary drug within four to six hours of the primary collapse while the patient is still responding to the Arsenic, otherwise you are in great danger of having a secondary collapse which you cannot combat. So remember that this is one of the very few instances in which one appears to ride right across the dictum that so long as the patient is improving one carries on with the same drug. In these acute cases if you have set up a re­action at all you have got to take advantage of it, otherwise patient will sink again. The drugs which as a rule I have found in these Arsenic cases go on to the reactive stage, are Phosphorus or Sulphur, but that is by no means constant. You can quite see that grey; pinched, anxious Arsenic patient responding, getting a little warmer, less pinched and drawn, not so anxious or rest­less, with a little more colour, and becoming a typical Phos­phorous type. Equally you can see them going to the other extreme, where they are too hot, with irregular waves of heat and cold, rather tending to push the blankets off, still with air hunger and going on to Sulphur. These are the two commonest drugs you will need, but whatever the response is you ought to be able to follow up immediately you get the action well under way. The Antimony tart. patients have very much the same sort of condition, but mentally they are quite different. In Antimony tart. there is a more definite tendency towards cyanosis than in Arsenic, you never see a patient needing Antimony tart, without very definite cyanotic signs in the finger nails, often extending over the whole of the hands, and the feet may be involved as well. We do not get the same degree of mental anxiety in Antimony tart, as in Arsenic. The patients are more down and out, much more hopeless and depressed. They are never quite so restless nor so pale. Again, there is none of the thirst you meet with in Arsenic, in fact anything to drink seems to increase the feeling of distress. Another contrast is that the Antimony tart, patient is very much aggravated by heat, and especially by any stuffiness in the atmosphere. But there is one point to remember here as a contrast between Antimony tart, and Carbo veg. : the Antimony tart, patients do not like a stream of air circulating round them; they want the room fresh, but they like it still. In most Antimony tart. patients there, is a very early tendency to oedema of the lower extremities. Another point which helps in your Antimony tart. diag­nosis is that practically all these patients have a very thickly coated tongue - it is a thick white coat- and a rather sticky, uncomfortable mouth.They have a feeling of fullness in the chest much more than the sensation of acute pressure found in Arsenic. And you are likely to find pretty generalised, diffuse rales in the lower parts of the chest on both sides. In contrast to Arsenic, the collapse is similar to that after a pneumonic crisis, and if the patient responds to Antimony tart. it will carry him through. You do not have to be on your guard to find the follow-up drug as you have to be in an Arsenic case. The Carbo veg. 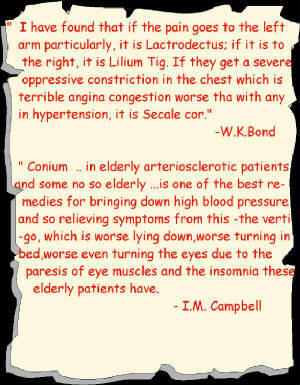 case gives the classical picture of the patient with all the symptoms of collapse. They have the cold sweaty skin, are mentally dull, rather foggy in their out­ look with not a very clear idea of where they are or what is going to happen to them. There is intense air hunger, and in spite of their cold, clammy extremities, they want the air blowing on them; they cannot bear the bedclothes around the neck and they do definitely benefit from the exhibition of oxygen. They are very much paler than the Antimony tart. patients, the lips tend to be pale rather than cyanotic, and there is none of the underlying blueness one associates with Antimony tart. The next point is that they always have a feeling of great distension, not so much in the chest as in the upper abdomen, and the cardiac distress is always associated with a good deal of flatulence. Like the Antimony tart. patients, any attempt to eat or drink tends to increase the distress, and they have none of the Arsenic thirst. Another apparent contradiction you come across in Carbo veg. is that, in spite of the desire to be uncovered and the intolerance of the blankets around the upper part of the neck or chest, these patients complain of icy-cold extremities, as if the legs were just lumps of lead, and they cannot get them warm at all. I think in Carbo veg. you have to be careful as to how long you are going to keep up your drug administration when you get the patient responding - sweating less, the surface becoming warmer, and the distress less acute. You are wise then to be thinking of a second drug, because some Carbo veg. patients do relapse although many of them make quite a straight recovery on that remedy. You do have to be careful. 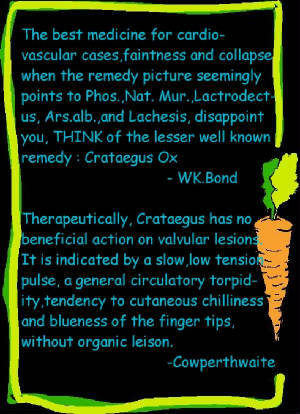 If you find the patient has responded up to a point on Carbo veg. do not imagine that a higher potency of Carbo veg. is necessarily going to carry on the improvement. As a rule it does not, and it is much better to look round for a fresh drug to keep up the reaction. In the majority of these cases the drug that follows best has been Sulphur, although Kali carb. should always be considered. The last of the drugs which I commonly think of for these collapsed conditions is Oxalic acid.Oxalic acid has one or two veiy outstanding symptoms which are a great help in the selection of that drug. The first is that the patients always complain of a feeling of the most intense exhaustion, very often associated with a sensation of numbness. They frequently state that their legs and feet feel numb and paralysed, as if they had no legs at all.The skin surface is just about as cold and clammy as it is in Carbo veg., but there is a peculiar mottled cyanosis in Oxalic acid which you do not get in the other drugs. The finger tips and finger nails and toe nails will be definitely cyanotic, but in addition there is a peculiar mottled appearance of the hands and feet which is quite distinctive of Oxalic acid. There is a somewhat similar mottled, cyanotic appearance in the face, especially over the malar bones.These patients, in contrast to the Arsenic type, want to keep absolutely still, and movement of any kind greatly in­creases their distress. In addition to the general distress, most of these Oxalic acid patients complain of very definite sharp precordial pains. These pains are not like the typical anginous stab, but more of a sharp pricking sort of pain which usually comes through from the back and may run up the left side of the sternum towards the clavicle, or down the left side of sternum into the epigastrium. The most startling cases giving this picture that I have seen have been in the critical stage of an influenzial pneu­monia where the patient was just fading out, having lost all strength, and the heart failing rapidly. I think all the patients of that type that I have seen have been left basal pneumonias. I remember seeing two or three patients who apparently were doing quite well on Natrum sulph. react beautifully to Oxalic acid. But one does get indications for its use in chronic cardiac cases as well.